Our knowledge of the changing status of the British reptiles and amphibians is far from complete and the challenge of collecting robust long-term monitoring data has been highlighted by a number of authors. Monitoring schemes are in place for rare or localised species and efforts are being made to develop long-term reptile and amphibian monitoring across the wider landscape. One habitat, however, of value to amphibians, and to a lesser extent reptiles, but which is currently poorly monitored is gardens. A national survey of amphibians and reptiles in gardens was launched in spring 2009 as a joint venture by the British Trust for Ornithology (BTO), Froglife and the Amphibian & Reptile Conservation Trust (ARC). Using a questionnaire-based approach, the survey set out to collect information on which reptile and amphibian species were present in gardens and what factors (both within and surrounding individual gardens) might influence species occurrence. A total of 3,806 completed survey forms was returned from England (3,428), Scotland (189) and Wales (189). An additional 19 forms from Ireland (14), the Channel Islands (1) and the Scillies (1) were excluded from all analyses because of sample size considerations and their different and impoverished amphibian and reptile faunas. Some 80% of responses came from participants in the BTO Garden BirdWatch, 16% from Froglife or ARC supporters and the remainder from the wider media appeals. Common Frog was the most commonly recorded amphibian (89% of gardens), followed by Smooth Newt (45%), Common Toad (44%) and Palmate Newt (8%). Slow-worm was the most commonly reported reptile (16% of gardens), followed by Grass Snake (13%). Records of rare or non-native species were validated through correspondence with volunteers, resulting in 17 records of ‘green’ frog, four of Midwife Toad, five of Alpine Newt, two of Sand Lizard and one of Smooth Snake. One of the ‘green’ frogs was likely to have been a European Tree Frog. The maximum number of amphibian species recorded from a single garden was six (two gardens), while the corresponding figure for reptiles was also six (one garden). Significant relationships between the occurrence of individual reptile or amphibian species and particular features within or surrounding the garden were identified. From these, some general patterns emerge. Rates of occurrence showed a general pattern of increase with increase in garden size. The permeability of boundary features was found to be important, with abiotic features like walls, buildings and fences tending to be negatively associated, and biotic features (like hedges) positively associated. The presence of ponds within the garden was found to be important for the occurrence of all the amphibians plus Grass Snake. At the level of individual ponds, occupancy was relatively low in the first year of existence but otherwise pond age had little effect. The presence of Goldfish appeared to exert a negative impact on the occurrence of newts, echoing the results of work elsewhere. The presence of compost heaps, log-piles and piles of rubble were positively related to the occurrence of all amphibian and reptile species, whereas plastic compost bins were not. There was no evidence that the use of herbicides, slug pellets or other pesticides had a negative influence on the occurrence of amphibians and reptiles in gardens. The occurrence of all reptile and amphibian species except Common Frog was negatively associated with the presence of parks, recreational areas, other gardens and habitats characteristic of an urbanised landscape. This might suggest a greater tolerance of urbanised landscapes for Common Frog. 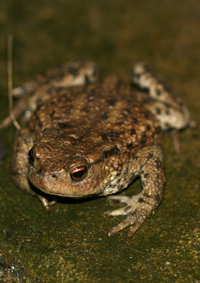 Major roads were found to negatively affect the presence of Common Toad, combined newt species and Grass Snake, suggesting they may act as a barrier. At a wider landscape scale the current study highlights generally positive associations between reptiles/amphibians and rural landscapes, and generally negative associations with urbanised landscapes (including parks, recreation areas and other gardens). The pattern of associations identified by our study, namely between features within and surrounding individual gardens, suggest that favourable gardens (in terms of the habitats they contain and the management practices adopted) may be separated by unfavourably managed gardens or other areas of unsuitable habitat (including physical barriers to dispersal such as walls, buildings and roads). This implies that gardens have the potential to provide good amphibian/reptile habitat but that good practices (both within and beyond the garden) are needed to realise this potential. Examination of BTO Garden BirdWatch data allowed us to model the potential for a citizen science approach to determine long-term trends in garden use by amphibian and reptile species. Two different modelling approaches, one based on ‘unmatched’ datasets and one on ‘matched’ datasets, revealed the potential of the scheme for long-term monitoring. These analyses provide evidence that the BTO Garden BirdWatch scheme would allow the annual monitoring of changes in garden use by Common Frog, Common Toad, Grass Snake and Slow-worm at the national level (the four species considered), to which Smooth Newt could be added, with an ability to detect changes in the order of 5-25% between two periods of time. The results of the survey were published as a BTO Research Report (No. 572).